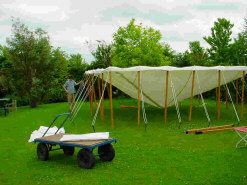 The Top Up Tents Team will deliver and erect your marquee. 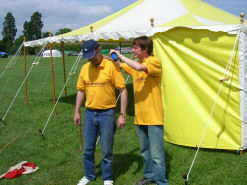 However it is the customer’s responsibility to care for the tent or marquee while in use. This involves firstly selecting a suitable site with no possible cables underneath. The marquee should then be kept as if it were your own! 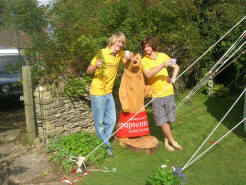 The Top Up Tents team are also cared for in the interests of health & safety with the provision of sun cream, suitable footwear, neat attire, superlative equipment and Earl Grey tea breaks. We therefore aim to provide clients with a clean cut, efficient, confident and helpful workforce.